When you’re in a blackout you’re probably wondering what is going on upstairs in that head of yours. Nothing good ever comes out of it because your mind just shuts off, but your body decides it wants to have a fiesta. The end result? A hangover that leaves you pondering every single life choice you’ve ever made. Sometimes, you need to tie yourself down to keep from spinning away. Needless to say, you should never drink to the point where you become one of these people. Hangover Fact: When the soft drink 7up was first created in the late 1920s it contained lithium, which was a mood stabilizer. The drink was marketed as a hangover cure at first. When you’re so hungover that you can’t even move your head, you know that it’s going to be a long day. 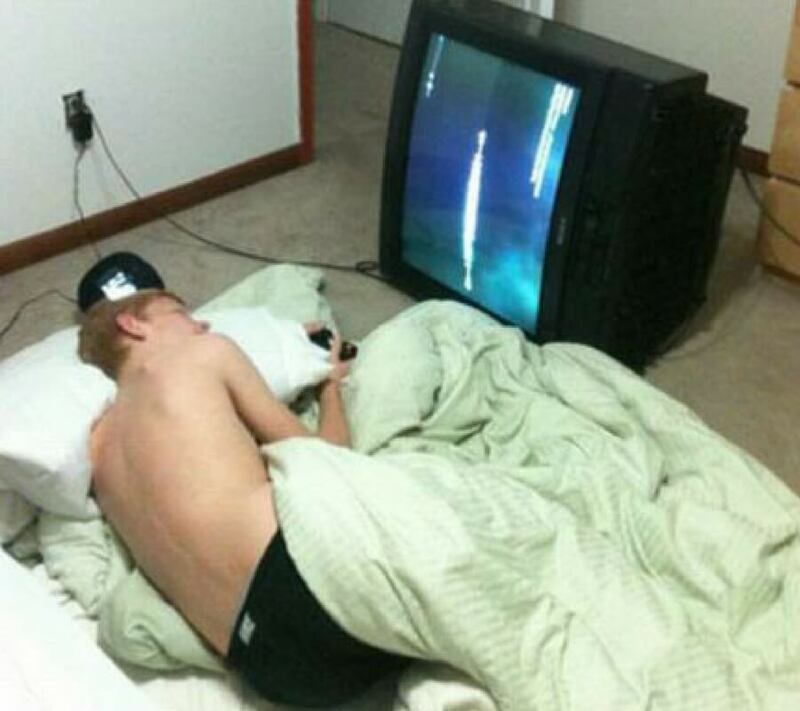 All you want to do is watch mindless shows on TV and doze in and out of sleep. Hangover Fact: It’s comforting to note that when you blackout it’s because your nerve cells are weakened and your brain can’t communicate properly with your body. You’re not actually killing any brain cells. In this situation you have two options — you either stick it out and wait for the person to wake up and get your acting ready, or you just book it. The latter is always the better option, but it’s more cowardly. If you’re going to stick it out, the key is to ask a lot of questions but never pretend like you don’t know their name. 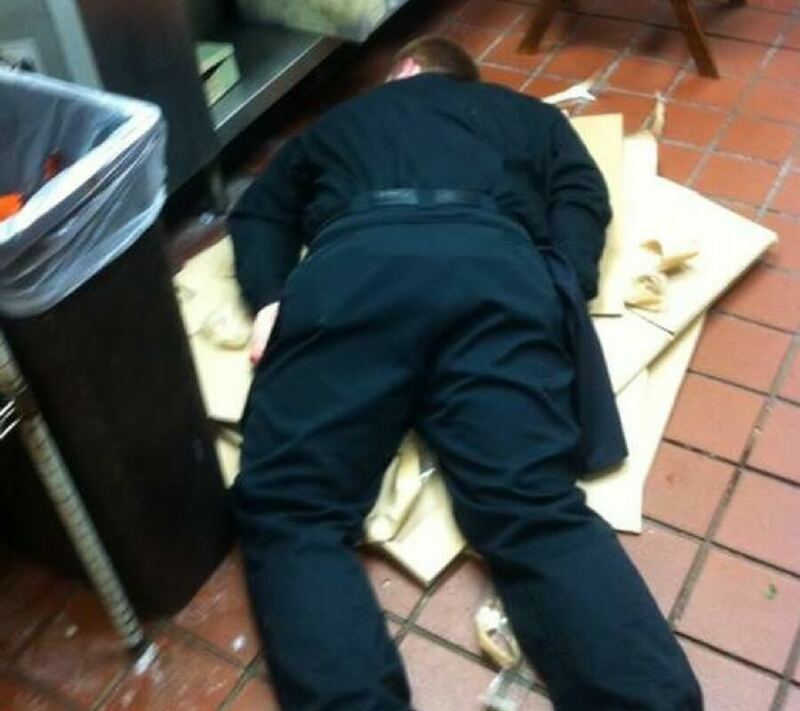 Hangover Cure: There is a service in Colorado that’s called Hangover Helpers which will come to your place, clean up after a party night, bring you Gatorade and cook you breakfast. 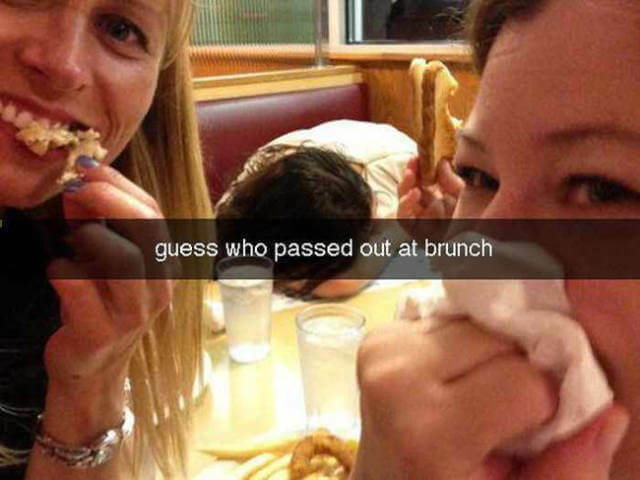 There’s nothing worse than getting dragged to brunch after a blackout. Your vision is blurry, your head is hurting, your stomach feels like it’s about to burst, and the texture of scrambled eggs is enough to make you gag. Just ahead, the hilarious hungover “not my problem” moment. Hangover Fact: The invention of brunch was actually inspired by the hangover. 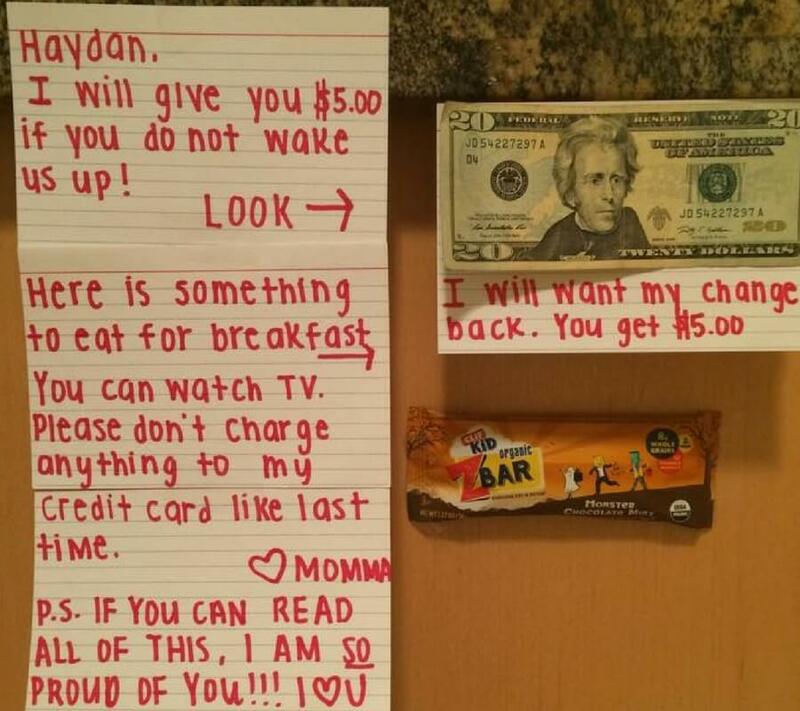 It was originally for people who were too hungover to wake up early but still wanted to eat breakfast food. Alchohol is poison, let’s not forget this. The result of poisoning yourself is that it makes every regulator in your body not work right. Your internal heater is very off, and you can’t decide whether you’re cold or hot. If you’re cold you want to be hot, and if you’re hot you want to be cold. Hangover Fact: Seth MacFarlane was booked on the American Airlines flight that ended up crashing into the World Trade Center. 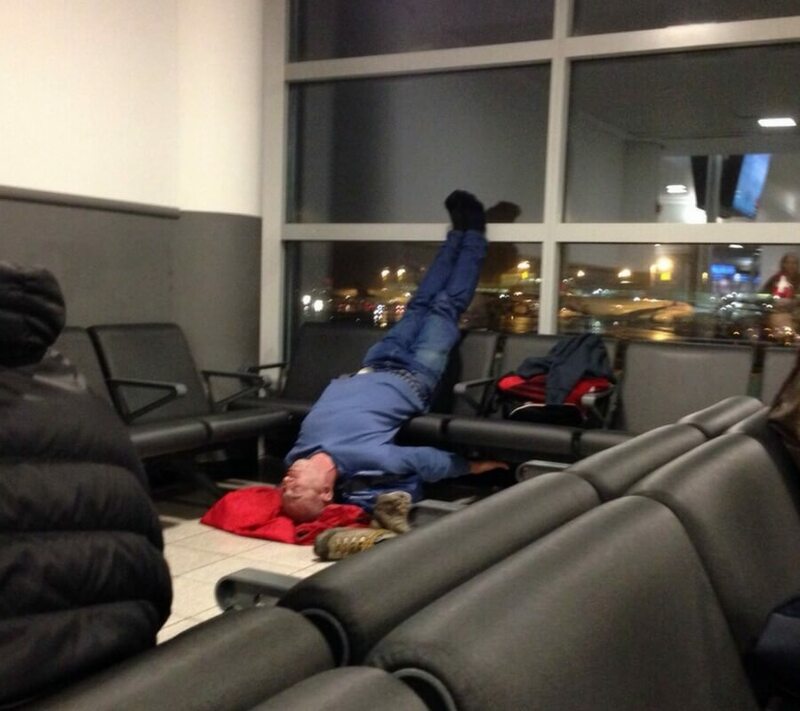 He ended up having to miss the flight because he was too hungover to wake up. Let’s be honest, when we’re in the middle of a blackout we all deserve to go into the trash. It’s our home. After screaming at the bartender to give you three more shots and getting dragged out of the bar by the bouncer, there’s no other place to go. Hangover Fact: If you ever think your hangover is bad, just know that the longest one ever lasted four weeks. A Scotsman consumed 60 pints of beer and basically died. He ended up being sick for the following month. Nothing matters when you’re hungover. Nothing. Your life? Nope. Catching on fire? Nope. Sometimes the hangover is so bad that you literally couldn’t think of a scenario in which you would move from where you’re passed out. 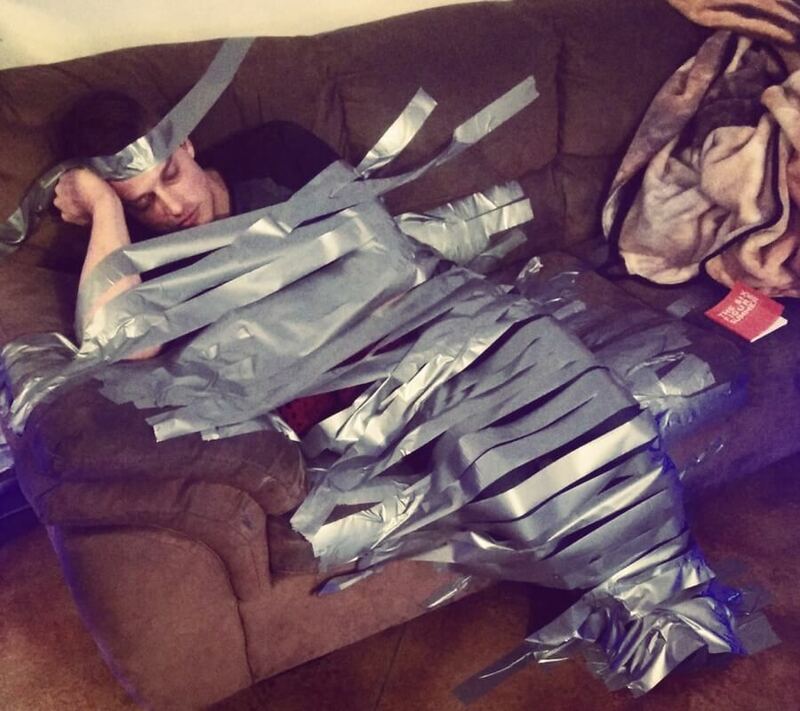 Find out what a few friends did to tie down their blackout friend and ensure he’ll be terrified when he wakes up. Can Someone Check Their Pulse? Hangover Fact: There’s a growing interest in IV hangover cures. For example, a service in Las Vegas will come to you and revive you from the deathly grasp of your hangover by hooking you up to an IV and giving you fluids and vitamins. 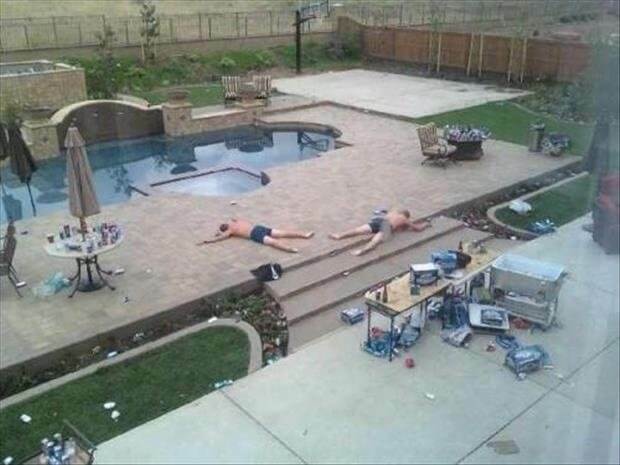 Hosting that pool party sounded like a great idea at the time. If your friends don’t think you died the night before, were you really even in a blackout? You’re not a true drunken mess unless at least one of your friends dial 911 as a precaution for your safety. Hangover Fact: In the US alone, companies will lose about $148 billion every single year due to hangovers. When you’re intoxicated your body just doesn’t care what position it’s in, it just wants to be laying down. After a few drinks, your limbs just turn to mush and you can put them in weird positions without even feeling it. Now, this claim isn’t scientifically proven by any means, but there has to be some merit. There’s no way this guy thought this was a good idea. Hangover Fact: There’s a difference between a blackout and a brown-out. A blackout is when you literally don’t remember anything. A brown-out is when you don’t remember how you got home, but you do remember how that hour-long life chat with the bathroom attendant went. 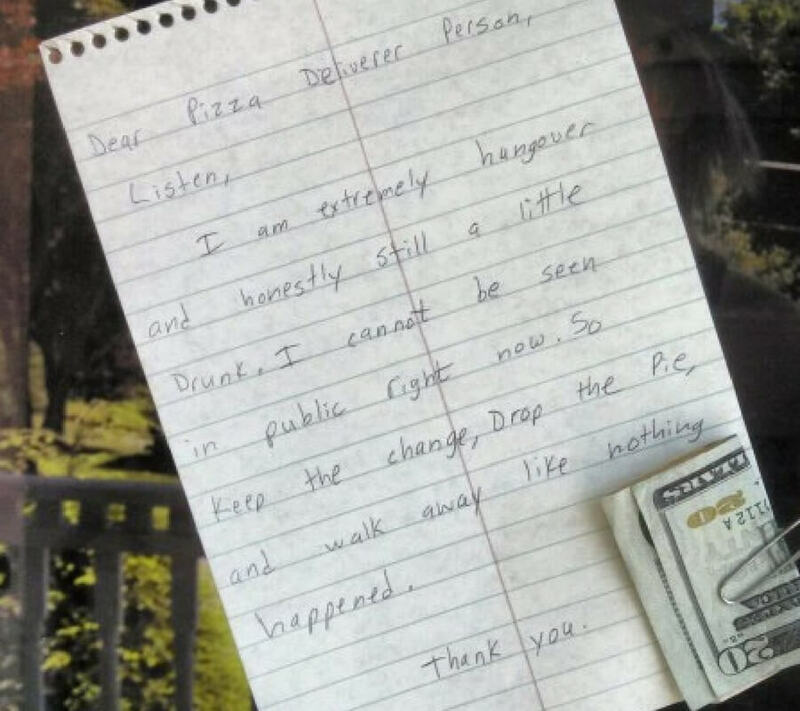 Sometimes this is what it takes to tame that drunk friend who won’t stop stumbling around. Duct tape fixes everything, including your blackout friend who has worse balance than Bambi on an ice rink. 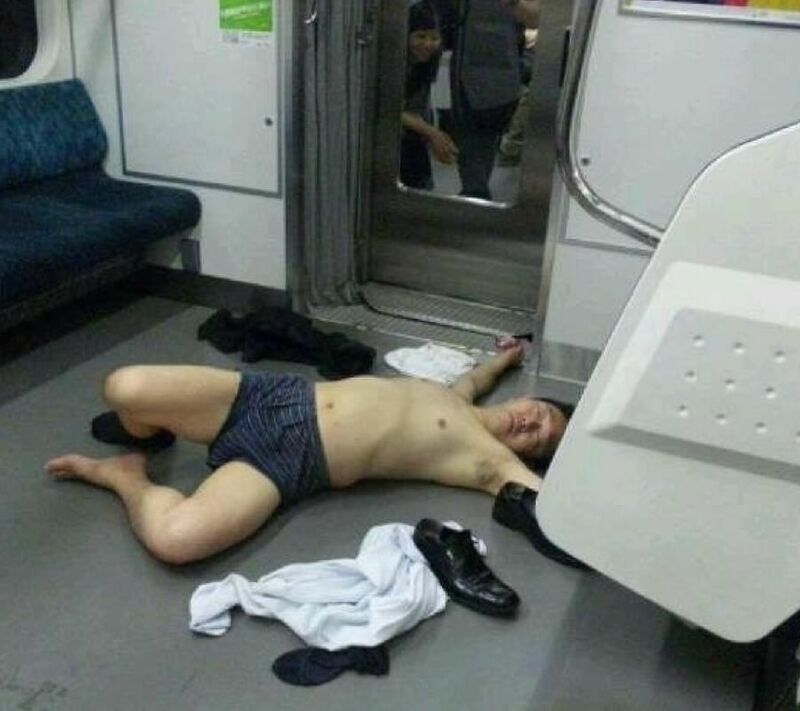 Ever passed out, mostly naked, on a train? This guy just ahead sure has. Hangover Fact:Eating pears before going out will significantly reduce the severity of a hangover. Pears contain enzymes that help to combat the symptoms of what alcohol does to your body. There’s no explanation why, but it’s a thing for people to go out the night before they have a flight to catch. They’ll go out drinking all night just to ensure they “wake up” for their 3 am departure time. While that sounds great at the time, this picture is the reality of it. Hangover Facts: Many Asians don’t feel as much “buzz” from alcohol, but they get worse hangovers. They have a genetic variation in which they metabolize alcohol more efficiently but not the toxic metabolite. 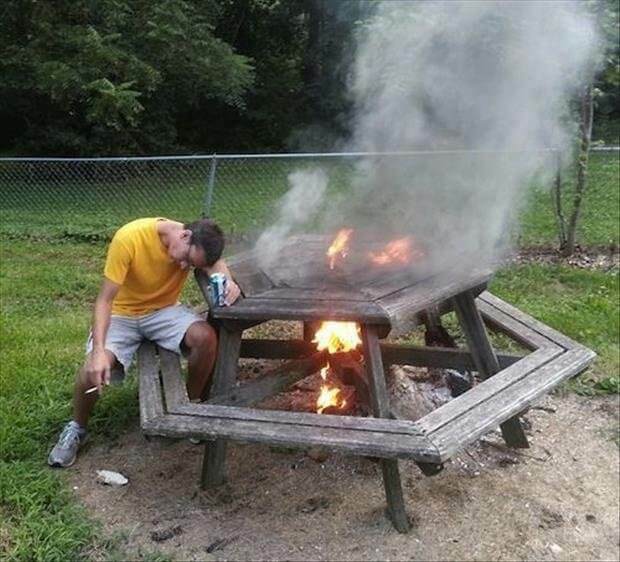 It could’ve been a lot worse for this guy. 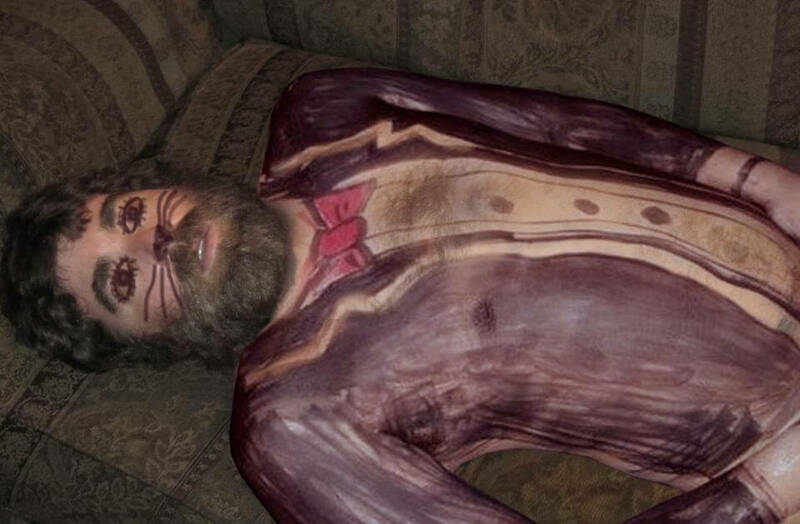 His friends could’ve drawn profanities on him which is the fate of most people who pass out beside Sharpie markers. They drew him a nice Calvin Klein suit which he should be thankful for. Double-breasted too. Hangover Facts: The term “hangover” didn’t exist until 1904. The original term was “crapulous” which is a word that dates back all the way to the 1530s. Again, never a good idea to drink the night before you have to be a productive citizen. This is what happens when you wake up 20 minutes after your alarm, and 10 minutes before your train leaves. You don’t have time to change, you just grab your clothes and sprint. This guy just ahead doesn’t even try to hide the fact he’s hungover at work and it’s “floors” me to look at. Hangover Fact: That headache you feel in the morning is due to the dehydration of the brain. Ethanol dries out the hormone that conserves the water level in the body. The brain loses so much water that it actually shrinks, causing the pain. Why is alcohol a thing? It makes you feel like you’re on top of the world for about three hours and then you live in a pit of misery the next day for seven. The trade-off is not fair, and yet we continue to drink it. Hangover Fact: People in Oregon post the most frequently about getting hungover. This shouldn’t come as a surprise since the state has garnered the title of being America’s “Beer Captial” due to their many breweries. This is just smart. 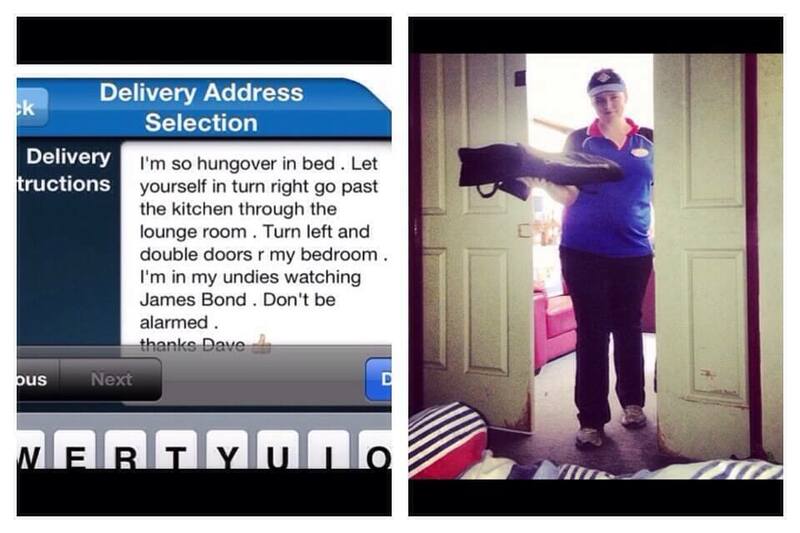 Why would you leave your bedroom if you can get door-to-door service from the Domino’s delivery driver? This is one way to ensure you get a tip. Papa Johns, how are you going to cater to the hungover community? Hangover Fact: Studies have shown that tequila will give you the worst hangover compared to any other type of alcohol. It has higher levels of methanol from the fiber content of Agave. 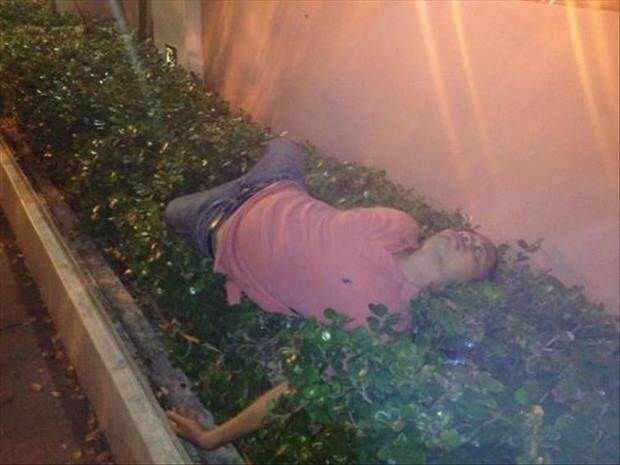 One tequila, two tequila, three tequila, floor. It’s an actual thing. Tequila has got to be the most frequent contributor to a blackout because one second you’re fine and the next you’re on the floor dying. Hangovers cause the creative (lazy) juices to flow and it sometimes works out in your favor like it did for this girl coming up. Hangover Fact: Hangovers are caused by acetaldehyde which is a product of the metabolism of ethanol and it’s very toxic to your body. They aren’t caused by dehydration which is what many believe. 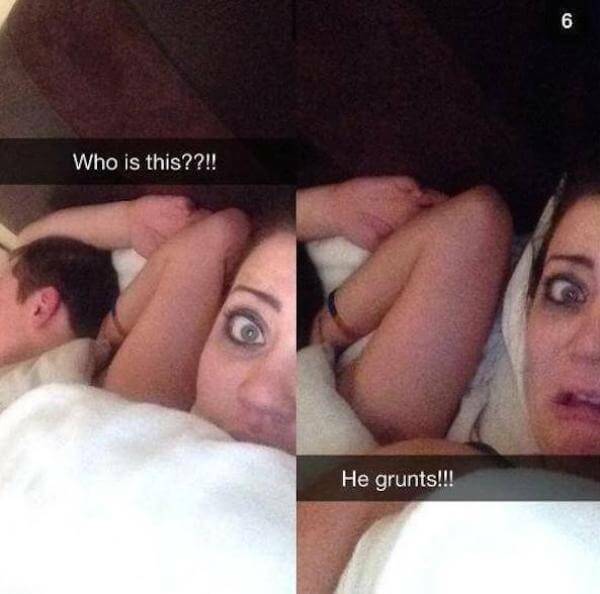 There’s nothing worse than having to deal with family and friends in the morning when you’re hungover. Everyone has that one friend who wakes up at 8 am after a blackout and is never hungover and doesn’t stop talking. Meanwhile, your head feels like it’s about to explode. Hangover Fact: Contrary to popular belief, there’s nothing in coffee that will actually cure your hangover. The caffeine will help sharpen your senses and make you believe that it’s helping but it’s not. 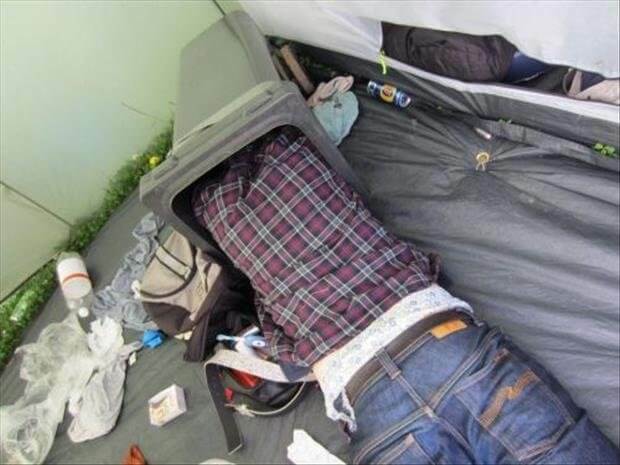 Do you ever just wish you could be inside your own head when you’re in a blackout to find out what you were thinking? This made sense to someone. 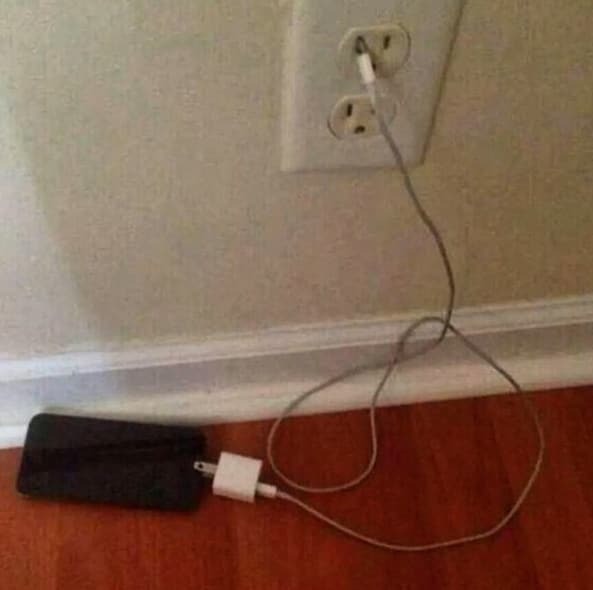 Someone literally saw this and went, “yep, that works” when attempting to plug this in. Hangover Cure: Bacon lovers rejoice! According to some researchers at Newcastle University, a bacon sandwich is one of the best things to eat if you want to cure a hangover. 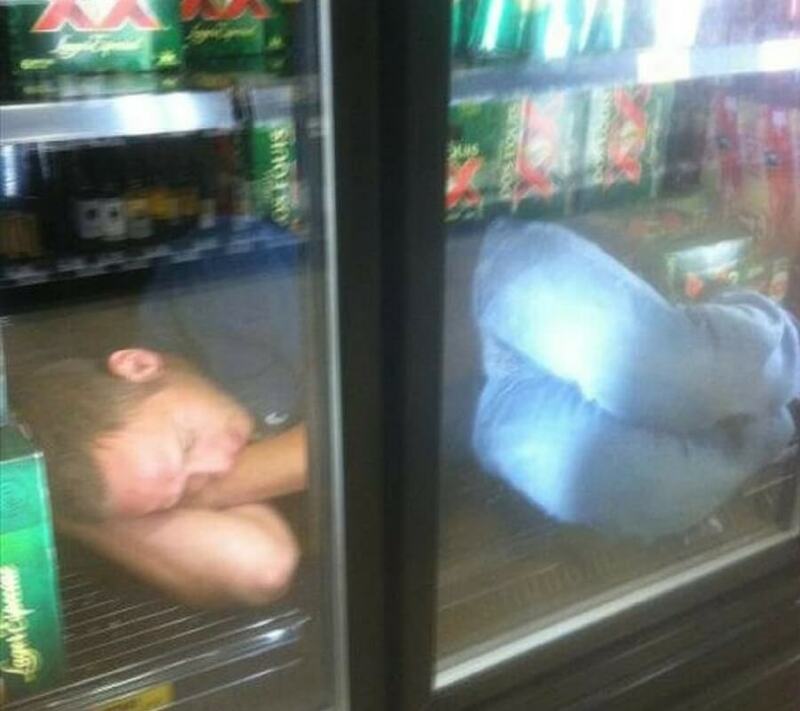 There’s being lazy, and then there’s being hangover lazy. The unintended positives of this is that you end up finding out things that you never would if you weren’t hungover. 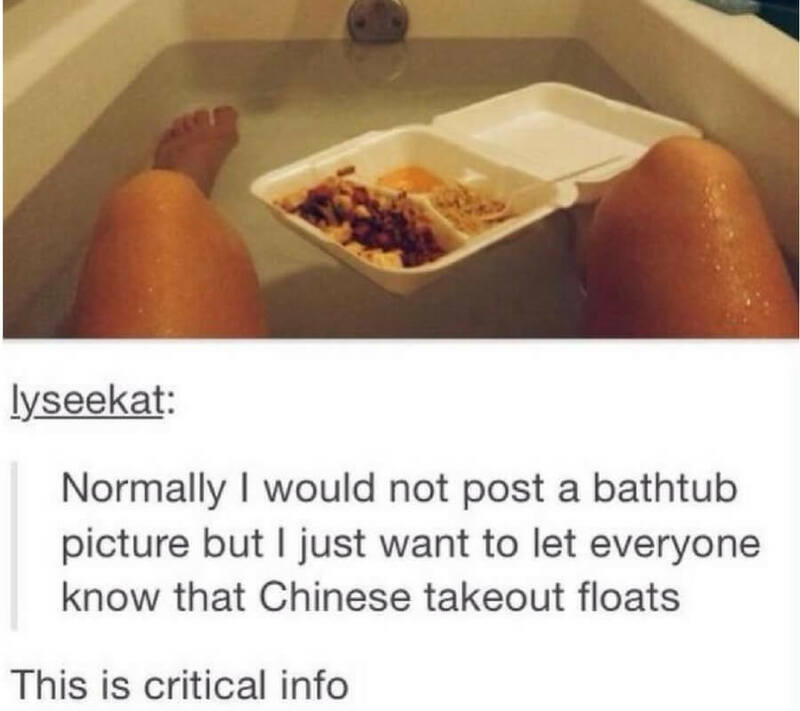 This girl just realized she doesn’t need to spend money on a kitchen table when she can just eat every meal on styrofoam in the bathtub. Hangover Fact: It shouldn’t come as too much of a surprise, but January is the month that claims the most hangover posts on social media. When you’re too hungover to be seen in public so you hermit around your bedroom binge watching The Office. It’s incomprehensible that some people can function on a hangover and go live their life as if they aren’t on the verge of puking every step forward. Hangover Facts: Usually, the darker the alcohol the worse your hangover is going to be. Bourbon, red wine, and rum have a higher concentration of congeners which metabolize into formaldehyde. There’s nothing worse than waking up from a blackout and not knowing who you are or where you are. 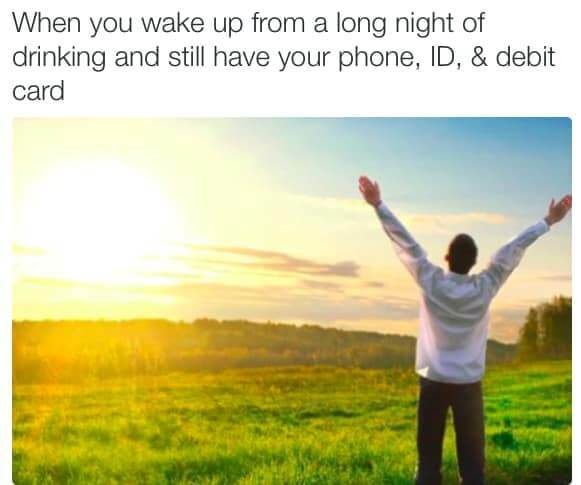 You immediately check to make sure that your wallet and phone are around because those are the first things to get lost. If you still have those intact, you won the night.